Lord knows I’m not above making a pita pizza from time to time, but usually it’s out of sheer convenience (and sometimes out of desperation). Before Jeffrey Alford and Naomi Duguid’s Eastern Mediterranean Pizzas, I certainly wouldn’t have gone through the trouble of making my own pita dough for one. Not that it was a hard dough to make or anything, but like any yeast bread, it does take time. The topping for these pizzas is lamb (although I used ground turkey) sautéed with onions and garlic, tomatoes and pine nuts. Mine wound up a little on the dry side, probably because I used cherry tomatoes, which didn’t give off much juice. 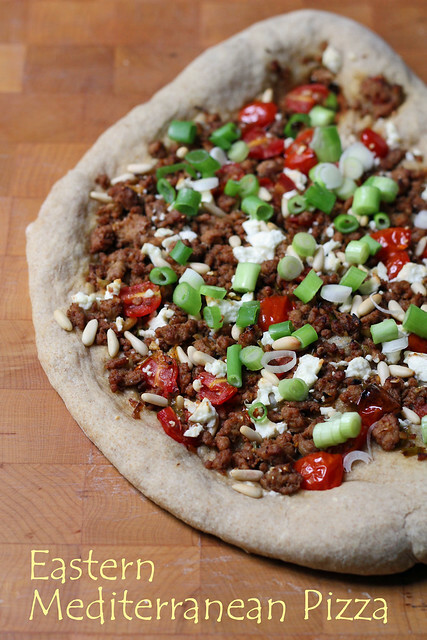 I tried to jazz up my finished pizza with some feta and chopped scallions, but if I make it again, I’ll make sure the topping has just a touch of sauciness to coat the meat. The bread dough has a fair amount of whole wheat flour in it, which gives it a slightly nutty taste. The recipe calls for baking individual pizzas, but I made a double-sized one instead and baked it on my pizza stone. Since I had to make pita dough before I could make the base of my pizza, I went ahead and made some actual pita breads with it as well. And then we had warm pita and hummus snack. 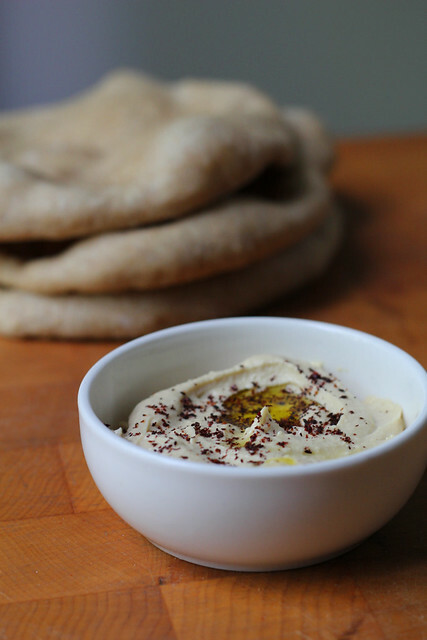 I was quite pleased that my pitas puffed enough to get a pocket– my husband initially didn’t believe that I made these, as I always get my pitas at the great Damascus Bakery here in Brooklyn. The next morning, I took my last homemade pita, opened its pocket, and made a fried egg sandwich out of it. Tasty! We’re going without hosts now for TWD, so for the recipe, see Baking with Julia by Dorie Greenspan. There’s also a video of Jeffery and Naomi making the dough and pizzas with Julia. Don’t forget to check out the rest of the TWD Blogroll! Yum! Your pizza looks great. I love the idea of doing an egg sandwich. luckily for us, it is tomato season and the tomatoes really made the topping special. pitas are so easy to make in a cast iron skillet, it didn’t heat the kitchen quite as much as the oven would have. Nicely done! I like the scallions on the pizza…makes it looks even more appealing! The scallions really add pop to our pizza! The photo of the pitas and hummus is beautiful. I missed this one but I wish I had done it now the pita breads look fantastic! Your pizza recipe looks exotic. Can’t wait to try it. this looks SO delicious! I reckon my kids would love this – I am going to try it out!